This article is about the video game. For heavyweight champions in real life, see List of heavyweight boxing champions. 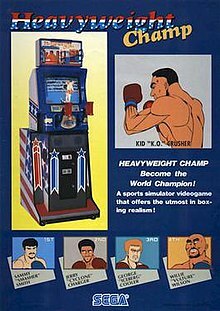 Heavyweight Champ is a series of boxing video games released by Sega. The original game was released in 1976. The game featured black-and-white graphics and critics have since identified it as the first video game to feature hand-to-hand fighting. Sega released a remake to arcades in 1987, changing the side perspective of the original game to a third-person viewpoint from behind the boxer. Both games feature unique controls that simulate throwing actual punches. The 1976 game is considered a lost video game. The 1976 game has monochrome graphics and side-view perspective. The 1976 original featured gameplay viewed from a side-view perspective. It employed two boxing glove controllers, one for each player, which moved up and down for high and low punches, with an inward movement for striking. It used large monochrome sprite visuals for the graphics. The 1987 game changed the perspective to behind the player's boxer. In addition, the player is given two punch controllers, one for each hand. Only a single-player mode was made available, in which the player faces a series of opponents in one-round, three-minute bouts. 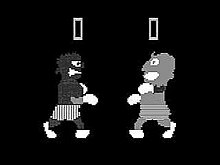 Players can swivel the cabinet to move their boxer from side to side. Sega reused the Heavyweight Champ name when they released the Sega Master System version of James "Buster" Douglas Knockout Boxing outside of North America. The game features a side perspective and is otherwise unrelated to the arcade games. It was not received well. The 1991 Sega arcade game Title Fight also featured controls for left and right punches and a similar behind-the-boxer perspective as the 1987 game, along with two-player gameplay through use of a dual-monitor cabinet. ^ "Heavyweight Champ (1976) Release Information for Arcade Games - GameFAQs". Gamefaqs.com. Retrieved 8 October 2017. ^ "Heavyweight Champ arcade video game pcb by SEGA Enterprises, Ltd. (1987)". Arcade-history.com. Retrieved 8 October 2017. ^ "Heavyweight Champ". Ultimate History of Video games. Retrieved 8 October 2017. ^ Loguidice, Bill; Barton, Matt (24 February 2014). "Vintage Game Consoles: An Inside Look at Apple, Atari, Commodore, Nintendo, and the Greatest Gaming Platforms of All Time". CRC Press. Retrieved 8 October 2017 – via Google Books. ^ "Heavyweight Champ (1987)". International Arcade Museum. Retrieved January 3, 2012. ^ "Heavyweight Champ". Advanced Computer Entertainment. March 1988. p. 26. ^ Kelly, Nick. "Heavyweight Champ. Commodore User. January 1988. ^ Heavyweight Championship Boxing. Mean Machines. Issue 7. pp 58-59. ^ Heavyweight Champ. Raze. Issue 9. p. 54. ^ Heavyweight Championship Boxing. CVG's Complete Guide to Sega. pp. 95-96. ^ Title Fight. Killer List of Video Games. Retrieved January 3, 2013. This page was last edited on 15 May 2018, at 22:04 (UTC).